“Can I ask you a question?” – Forced Entertainment’s 24-hour Quizoola! A few months before Forced Entertainment brought its 24-hour endurathon performance of Quizoola! to the Barbican’s Spill Festival, I got my first smartphone. Nothing special in this – I am probably the n-billionth person on the planet to have an iPhone to fiddle with, but I have noticed how unquiet the device has made me. I can choose to be switched on day and night. I have multiple social media apps with which to ignore people. Of course one can turn off push alerts and all these things, but actually who does? I have spent months fighting the urge to fiddle with it and I am not the first person to succumb to an obsessive-complusive-data tic. It’s unpleasant. Terry O’ Connor and Tim Etchells about 22 hours into the 24-hour Quizoola! I mention this because of two things: first, I’m thinking about listening and silence and stillness in preparation for a lecture I’m giving on John Cage in Brussels next month (see tenuous link below) as part of The Wire magazine’s Primer series; and secondly, because succumbing to the rhythms of Quizoola! was a relief. 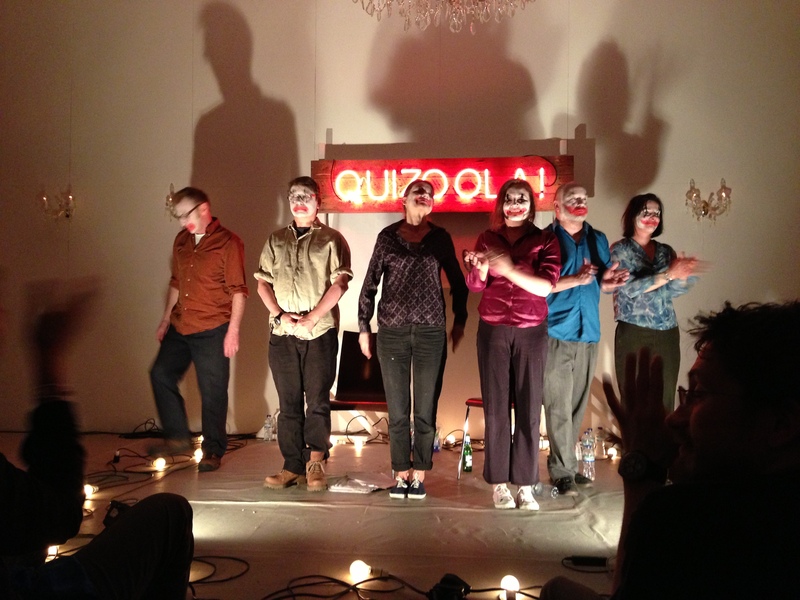 Like all of Forced Entertainment’s durational works, Quizoola! 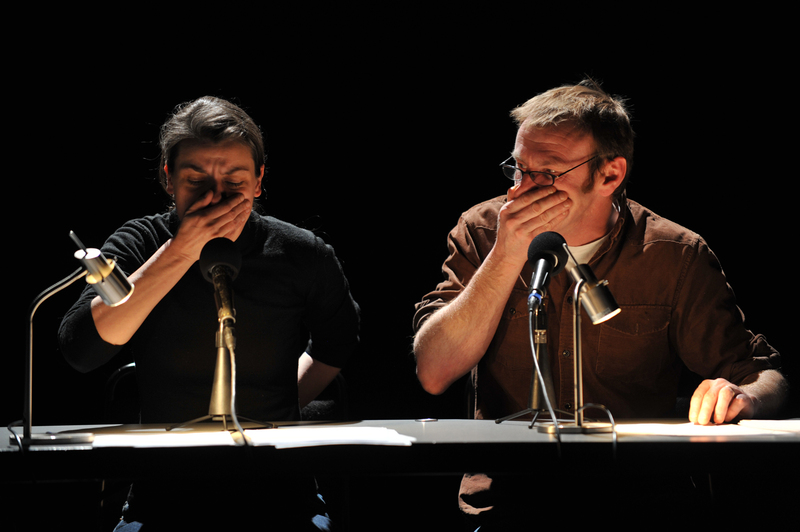 – a theatrical situation that is part quiz show, part interrogation – is, to some extent, informal theatre. You could enter and exit at will; there are no delineated seats to be kept to; and none of the codes that pertain to behaviour at more conventional performance, which means there’s the option of phone fiddling. Yet Quizoola! has always been a ritualistic performance – at any one time, two performers, smeared with clown makeup sit in a circle ringed with lightbulbs and ask and answer questions from a wodge of over 2,000 scripted questions (some, this time, submitted in advance by the public); a third performer sits disinterestedly on a ticket desk at the door of the auditorium. Lies, evasions and truths are on show. And ritual, in the way it focuses and condenses that which is left outside, has a way of becoming that is real. Quizoola! is about endurance and about witnessing in real time: to opt out of it, once it’s begun is somehow to pull oneself away from any engagement. Sod the iPhone: Quizoola! – always brilliant, insane, funny and profoundly moving – is a network of its own devising. Q: What is the French for 12? A: I don’t know. I can’t remember. Q WHAT IS THE FRENCH FOR 12? Q: What is the French for 20? Q: WHY ARE YOU LYING TO ME? Q: What is another word for 12 in English? A: Un, ooone, deux… I don’t know. Q: When did you last go to Ikea? A: Recently. A few months ago. It was in Montpellier, actually. Q: [Incredulous] How on earth did you communicate? The thing is compelling: a live webcast meant that I could watch Cathy Naden and Claire Marshall on stage at 7am while I was in my kitchen. At that stage, the performers were relatively fresh: it was much later that guards slipped. The frisson that went through the theatre when Catholic clergy were referred in one answer as “superstitious kiddy-fiddlers” was audible. It’s two weeks since Quizoola! ended and I still miss it. Forced Entertainment, a performance company that is no stranger to durational work, is embarking on one of its longest sessions for a long time in April when it stages a 24-hour version of Quizoola! 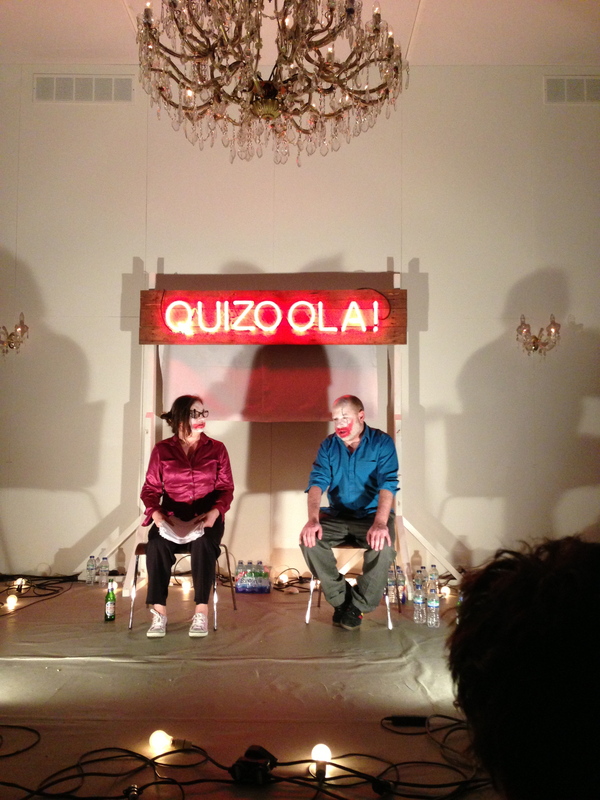 A question and answer-based show that was first staged as a 45-minute work in 1996 at the ICA, Quizoola! takes interrogation to new levels. It’s playful, it’s nasty, it’s theatrical waterboarding without the water.